I came across a flag which is very usual in demonstrations and events of the youth organization of the Portuguese communist party (J.C.P. / P.C.P.). It consists of a Cuban flag defaced with the likeness of the mythical communist hero Ernesto "Che" Guevara. A similar flag, all red with black elements and bearing at times the Cuban slogan "hasta la victoria siempre" ("towards the victory, always"). I'm not sure if any of these are used by communists anywhere else, namely in Cuba, but it is most likely. This non-Cuban "Che flag" is or was, according to Jaume Ollé, used by a ultra left guerrilla group in Guatemala. I used darker colours because flags appear with darker colours. These flags are, of course, unofficial, so the shade here is basically a matter of taste, but they are usually used with darker colours than those we have in the Cuban national flag. Located in the lobby of the Hotel Nacional in Havana, Cuba is a flag which commemorates the 40th Anniversary of Che Guevara's death. 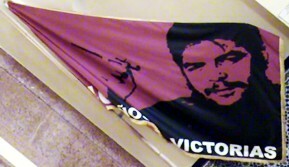 The flag shows an image in black of Che Guevara holding up a Cuban cigar. Along the bottom in white are the words: "40 AÑOS DE VICTORIAS"
EL CUADRAGÉSIMO ANIVERSARIO DE LA CAIDA EN COMBATE DE ERNESTO (CHE) GUEVARA. THIS FLAG, COMMEMORATING THE 40TH ANNIVERSARY OF THE DEATH OF ERNESTO "CHE"
GUEVARA , WAS GIVEN EXCLUSIVELY TO THE HOTEL NACIONAL DE CUBA.